I love booze luges! There's something cool about pouring a shot at the top of a giant block of ice and watching as it travels down through the carved icy slopes, gaining extra chill, before plummeting into your awaiting open mouth or shot glass. 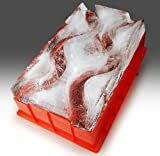 Well now you can make your very own ice luge easily using the cool new LugeCubes - Ice Luge Molding System. 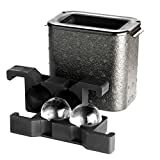 Rather than trying to freeze a massive block of ice and then carve out channels or mess with complicated tubing, this simple and innovative modular ice luge kit, allows you to freeze the different sections separately in an average freezer and then connect them together when frozen. Just fill the three custom mold designs with water (TIP: Boil distilled water and let it cool for crystal clear ice), freeze, assemble and luge on. The molds include carefully-crafted tubular luges that when assembled let you watch the liquor as it travels down through the inside of the ice and even includes a removable, reusable drinking spout. It truly is the ultimate liquor run - see you at the bottom!